China’s most vibrant city is undergoing a glamorous transformation that’s putting it on a par with some of the world’s biggest culture capitals. “Build, build, build” has been China’s mantra ever since former leader Deng Xiaoping launched the country’s transformational economic improvement program, translated literally as “reform and opening-up,” in the late 1970s. But of all the mainland’s most improved municipalities, Shanghai is perhaps the poster child for China’s rapid fiscal growth and urban development in recent years. While other first-tier cities like Beijing or Guangzhou have also seen major infrastructural changes, Shanghai has an advantage in its long history as an international hub. Thanks to its position as a major port city since the 19th century, Shanghai has always attracted a large expatriate community, whose imprint is reflected in the buildings of its various neighborhoods—especially in the former International Settlement and French Concession, where a lasting European impact is evident in the city’s architectural heritage. But to simply label the city an intersection of East and West doesn’t quite do it justice. Here, these opposing forces don’t just meet: In the new millennium, they’ve collided at full speed and amalgamated to transform the city into one of the world’s most important and eclectic financial centers. Shanghai changes often, and it changes fast. What was all farmland on the eastern side of the Huangpu River just a few decades ago is now the Lujiazui Financial District, famous for the Blade Runner–esque structures that comprise Shanghai’s iconic skyline: The 128-story Shanghai Tower by Gensler, China’s tallest building and the world’s second tallest; the Kohn Pederson Fox–designed Shanghai World Financial Center, a.k.a. the “Bottle Opener”; Jin Mao Tower, by the firm SOM; and the spaceship-like Oriental Pearl TV Tower, by architect Jiang Huancheng. Across the river, the Bund—a mile-long riverside boulevard lined with dozens of classic European-style buildings that housed the regional headquarters of trading companies and foreign banks a century ago—has morphed into an epicurean and entertainment destination filled with restaurants by renowned chefs such as Jean-Georges Vongerichten and Joel Robuchon. A telling sign of the city’s prosperity, the list of heavyweight chef arrivals continues to grow year after year. This past summer, Pierre Gagnaire debuted Le Comptoir at the new Capella hotel in the former French Concession, Yannick Alleno unveiled his Terroir Parisien bistro at the Raffles City Changning shopping complex in November, and British chef Jason Atherton is expected to open his third Shanghai restaurant inside The Edition hotel on East Nanjing Road by spring 2018. The blossoming culinary scene has been matched by a growing appetite for the arts. The West Bund has transformed into a breeding ground for the creative class, where some of the best-curated museums and galleries have replaced the abandoned aircraft factories from decades ago. It’s also the site of the annual West Bund Art & Design Fair, with the most recent edition showcasing works from 70 Chinese and international galleries. By 2019, the area will welcome an outpost of Centre Pompidou, designed by British architect David Chipperfield. The collaboration between the renowned Paris modern-art institution and the West Bund Group—the mastermind and developer behind Shanghai’s own “Museum Mile”—will serve as an important symbol of cultural exchange between France and China. Also in the works is the Dream Center, an entertainment venture with ambitions to host Tinseltown-grade film premieres and world-class performing arts. Over in the M50 art district, construction on Heatherwick Studio’s “1,000 Trees” project—an expansive mixed-use development of homes, schools, and retail designed to resemble a 3-D forest—is also underway. Major transformations aren’t happening just on a macro infrastructural level: The 25 million residents here have seen the makeup of their city continue to evolve. One thing that has left a deep impression on me since my first visit to in 1998, and even more after I became a full-time resident in 2009, is the city’s raw, palpable energy. In recent years, Shanghai has attracted young professionals and entrepreneurs from other cities in China and around the world who want to capitalize on a market that’s still finding its way but has loads of growth potential. Some say the vibrancy reminds them of the glamorous 1920s and ’30s, and that the city has simply regained its mojo after a few tumultuous decades in the mid-20th century. “It’s like New York on steroids,” said a friend, summing up what life in Shanghai feels like today. I couldn’t agree more. 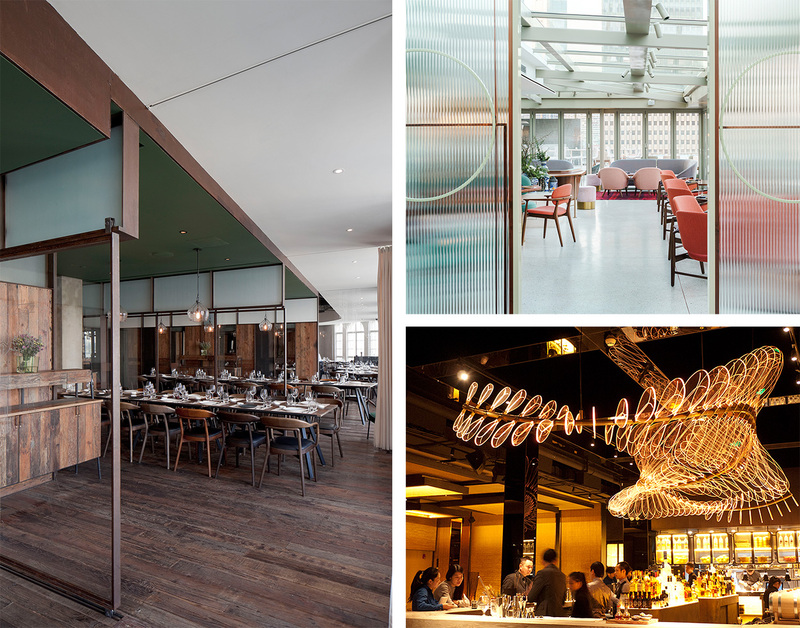 It’s been a busy year for Shanghai’s hospitality industry, with numerous high-profile openings. 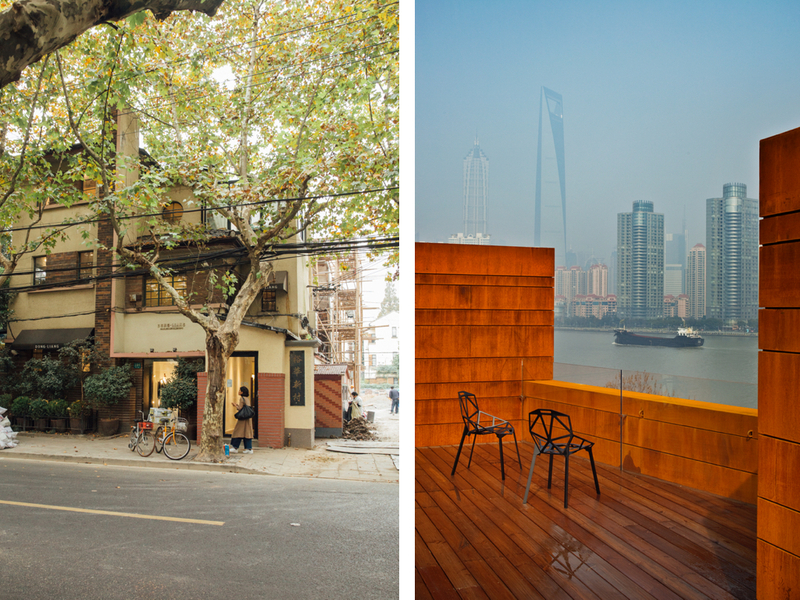 The standout is Capella Shanghai, Jian Ye Li, housed in one of the few remaining clusters of traditional townhouses. Originally built in the 1930s as residences for upper-class families and expatriates, Jaya International Design restored the interiors of the villas, which pay homage to the era’s Jazz Age aesthetics with Chinese and French touches. Two highly anticipated arrivals debut early next year, including China’s fourth Aman outpost, Amanyangyun. Constructed in an ancient forest of camphor trees—a painstaking process overseen by experts hired by entrepreneur and philanthropist Ma Dadong that included the restoration of abandoned stone structures from the Ming and Qing dynasties—the property was transported nearly 435 miles to its new home in Minhang District. Kerry Hill Architects and landscaping specialists from Dan Pearson Studio outfitted the 24 wood-clad suites and 13 antique villas with courtyards, outdoor freestanding tubs, and the occasional plunge pool. Meanwhile, on bustling West Nanijng Road, Italian architect Piero Lissoni fused his Modernist approach with local inspirations at The Middle House: shellac-finished Chinese chests repurposed as sleek cabinets for the minibar; Chinese art incorporated into the headboards of beds. The flurry of ribbon cuttings has added variety to the landscape, but a few stalwarts remain as stellar as ever. Though Shanghai Tower’s J Hotel will soon steal the title of the city’s highest property when it opens next year, the 174-room Park Hyatt, on the top floors of the Shanghai World Financial Center, is still the ultimate indulgence. 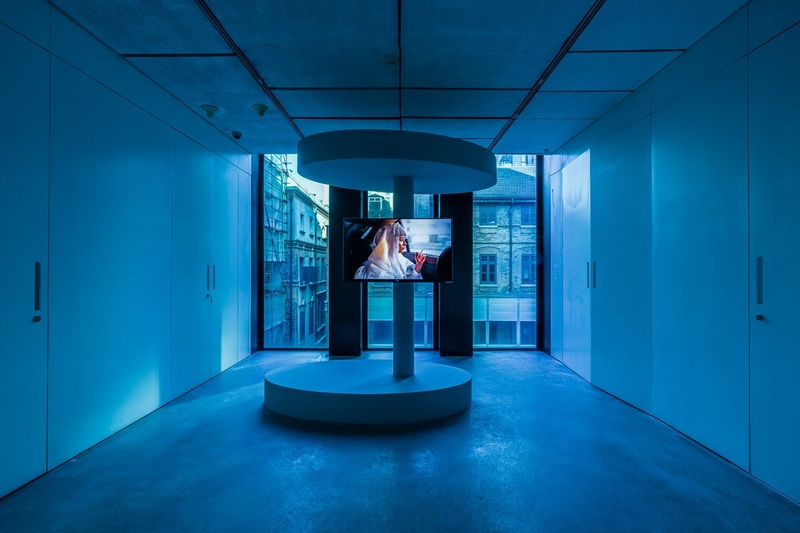 Designer Tony Chi’s modern residence concept features a series of gates, halls, and chambers lined with art installations that connect various social venues high in the clouds, the 92nd-floor bar with ceramics by Liu Jianhua strung from the ceiling among them. 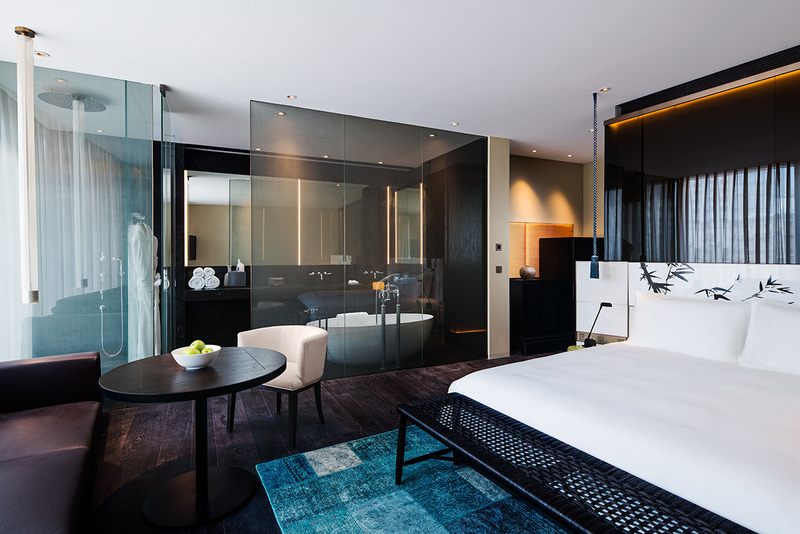 On the other end of the spectrum, the minimalist Puli Hotel and Spa, in Jing’an, offers a nice change of pace from the over-the-top luxury offerings. Kume Sekkei Japan and Layan Design Group washed the interiors with handcrafted decorations such as silk wall coverings and porcelain vases. The spa’s tea-based treatments and chef Michael Wilson’s elegant Michelin-starred French restaurant overlooking Jing’an Park are highlights. 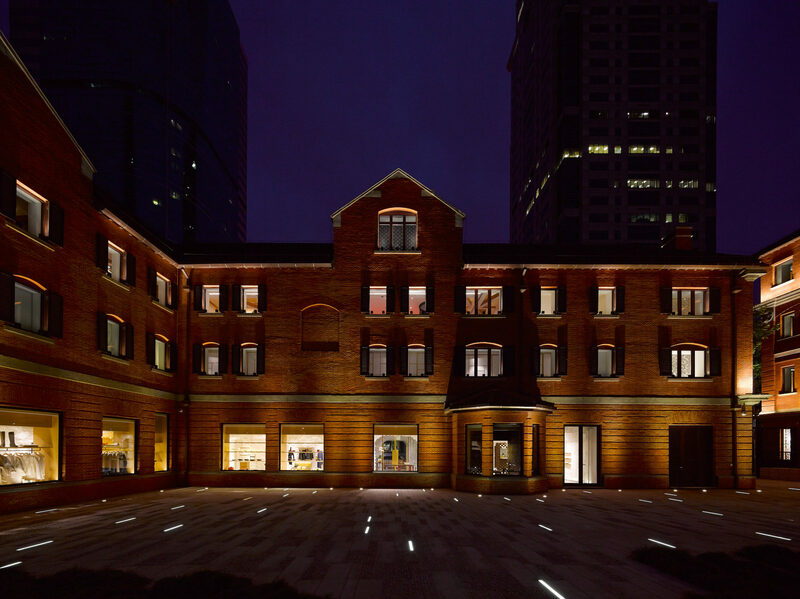 At Waterhouse at South Bund, Shanghai-based architects Neri & Hu serve up a master class in the integration of old and new, with the tactful transformation of a 1930s Japanese army headquarters in the Cool Docks area. 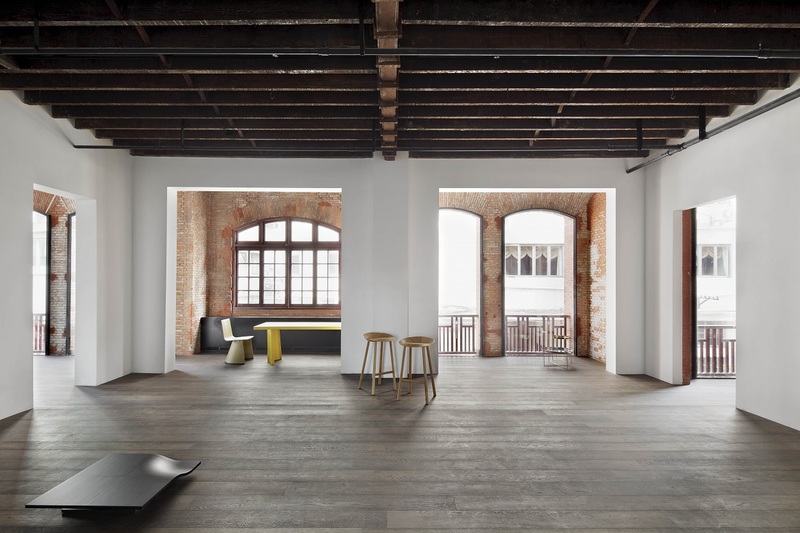 The public spaces and 19 rooms reference Shanghai’s classic shikumen-style architecture with cracked concrete and original exposed-brick walls, offset by blond-wood floors, Moooi sofas, and a rust-colored Corten steel extension on the roof. Also on hand: a popular communal-style bistro serving modern European dishes. Look for more big openings in 2018, including an outpost of Ian Schrager’s powerhouse Edition brand. The importation of celebrity chefs from the West has started to influence Chinese toque-wearers who generally keep a low profile. There isn’t a better example than hometown talent Tony Lu, whose star has risen thanks to a string of successful Shanghainese restaurants housed in Concession-era villas in the Changning District. His latest is Fu He Hui, a shrine to haute vegetarian cuisine. Natural materials such as stones and wood team with neutral-tone fabrics to create a Zen ambiance—just the setting in which to sample elaborate courses made with hyperseasonal produce, including the tomato “ravioli,” with smoked mashed potato, egg yolk, pea, and onion powder. If Lu is pushing the boundaries of vegetarian ingredients at Fu He Hui, Paul Pairet’s Ultraviolet defies the norms of gastronomy altogether. 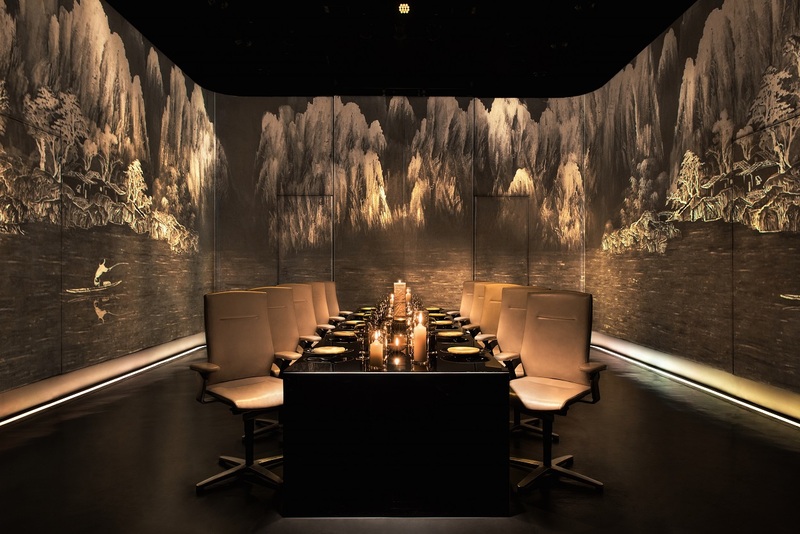 The chef worked with Magma Design to conceive a multisensory experience that transports 10 diners each night from Mr. & Mrs. Bund—another popular Pairet concept—to an undisclosed location for a 20-course tasting journey. Served in a room encased in a 360-degree projection wall, each dish is paired with visual and audio effects, and matching scents. For instance, upon serving the “truffle burnt soup bread,” an image of a wintery forest appears, along with the musky aroma of wet soil, to enhance the earthy taste of the dish. Be warned: Seats don’t come cheap (around $600–$900, depending on the day of the week), and a three-month advance booking is standard. 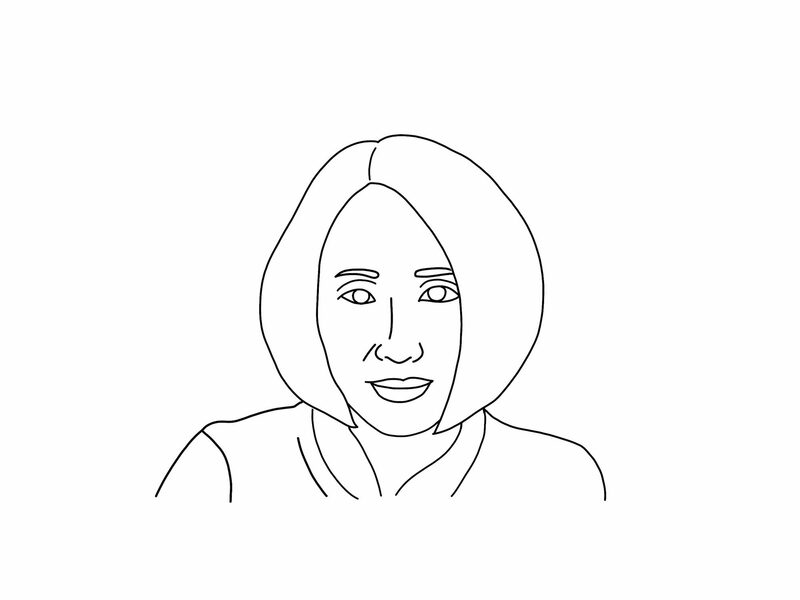 Even as Chinese chefs continue to raise their stature internationally, the wave of Western satellites has not abated. One early pioneer was Jean-Georges Vongerichten, who brought his eponymous fine-dining concept from New York to Three on the Bund, a Neo-Renaissance-style building, in 2004. A makeover in 2016 by longtime collaborators Neri & Hu refashioned the original gentlemen’s-club look into an airy, cream-colored space, which embraces the building’s Beaux-Arts heritage with restored elements such as the foyer columns and cornices, while window-side antique mirrors etched with quotes from French philosophers show glimpses of Shanghai’s skyline. Two floors above, the firm was tapped again for Vongerichten’s coastal Italian spot, Mercato, whose runaway success has sparked spinoffs in Hong Kong and Hangzhou. Exposed Victorian ceilings, timber canopies, and streetlamp-style lighting imbue the space with a rustic feel reminiscent of a market, albeit one with elevated cuisine: wood-fired pizza with black truffle, three cheeses, and farm egg; porcini-crusted salmon with warm leek vinaigrette and herbs. A short walk away is The Nest, a gastrolounge and one of the central players in Shanghai’s cocktail revolution. Designer Andy Hall from MQ Studio incorporated a minimalist Scandinavian aesthetic into an expansive dining room that conjures a Mad Men–era loft, with midcentury lounge furniture and beige woven fabric panels. Chef Freddy Raoult’s creative take on the cuisines of Northern Europe is reason enough to book a table, but the inventive drinks—try the Coco Django, a blend of lemongrass-infused vodka, coconut rum, ginger liqueur, and curry powder—keep patrons coming back again and again. There’s a joke among locals that speakeasy-style places now outnumber regular bars. Speak Low became a forerunner of the trend when it launched a few years ago with a warren of spaces housing bartender Shingo Gokan, himself a trailblazer of the craft-cocktail movement at New York’s Angel’s Share. Upon entering the Ocho bar-supplies store on Middle Fuxing Road, one encounters a trap bookshelf leading to three distinctive rooms: a casual American tavern kitted out with a copper bar and floral-print ceiling, an intimate den dedicated to small-batch distillers and elaborate garnishes, and a rare whiskey lounge concealed behind an “Employees Only” sign. Another fad making its way east? The all-day café. A must-visit for brunch is Highline, near the Xintiandi entertainment district, where culinary power couple Anna Bautista and Sean Jorgensen turn out modern American dishes such as chicken and waffles with bacon butter, and Southern-style eggs Benedict with pulled pork. Taking a cue from the expansive tree-lined terrace, the owners and local firm Red Design dreamed up the midcentury, California-inspired scheme, with low-slung, pastel-hued chairs and banquettes, mahogany credenzas, and a sunlit sky room that transitions into an intimate dining room. Like New York and Los Angeles or Toronto and Montreal, Shanghai and Beijing have a longstanding sibling rivalry on a wide spectrum of issues. 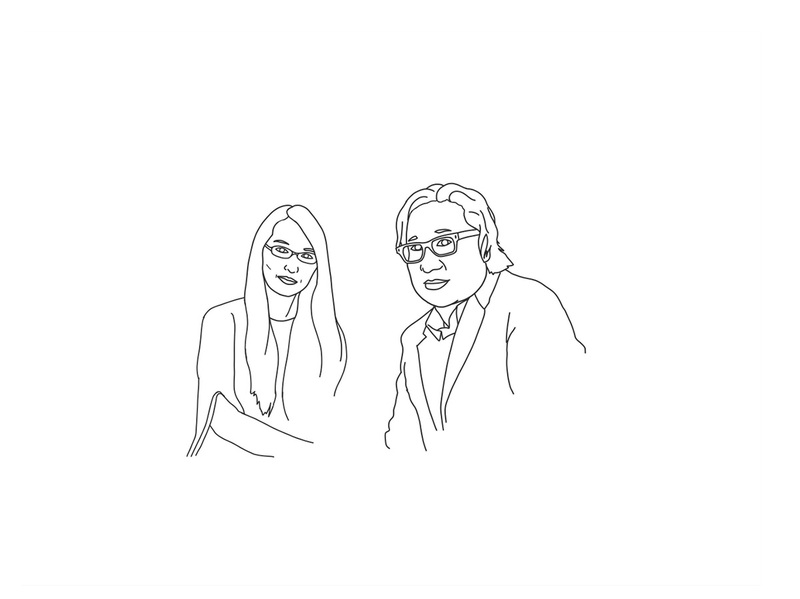 That includes art supremacy. These days, Shanghai is giving the capital a run for its money. A concerted effort by the government to boost its soft power and improve its image on a global level has facilitated a cultural arms race. One of the most visible examples is the ongoing development of the West Bund, along the Huangpu River in the Xuhui District, an area dedicated to the arts, media, fashion, and design. Founders and art collectors Liu Yiqian and Wang Wei enlisted Atelier Deshaus to design the three-year-old Long Museum West Bund around a 1950s coal-hopper-unloading bridge. The result is a monochromatic, umbrella-vaulted structure whose minimalist curved walls and ceilings complement the industrial exterior. Visitors will find contemporary art exhibitions by Chinese and international artists James Turrell and Olafur Eliasson. A short bike ride away, architect Sou Fujimoto converted an erstwhile airport hanger into the Yuz Museum, part of Jakarta-based philanthropist Budi Tek’s nonprofit foundation. Its massive exhibition space has hosted major shows such as Alberto Giacometti’s “Retrospective” in 2016, and “Where the End Starts,” by Brooklyn-based artist Kaws this summer. 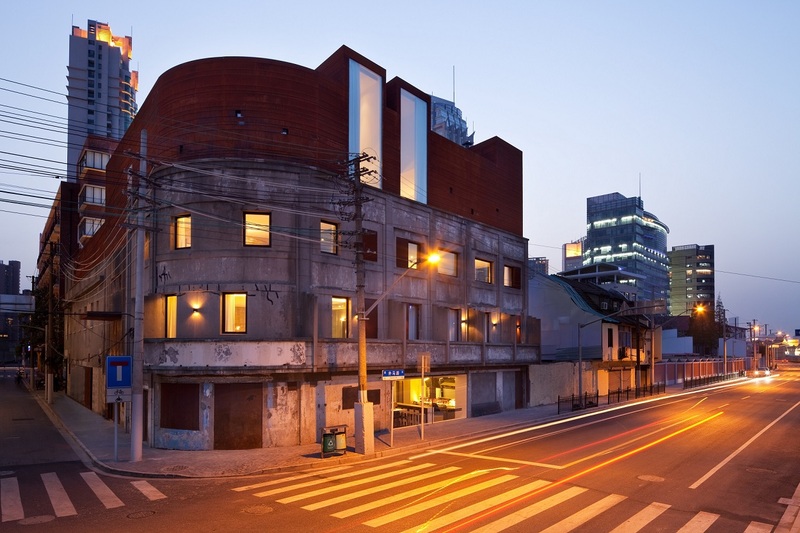 Next door is the Shanghai Center of Photography, opened by Pulitzer Prize–winning photojournalist Liu Heung Shing and designed by American architects Sharon Johnston and Mark Lee. SCoP’s programming is consistently strong. Case in point: the current exhibition “Acting Out,” by Wing Shya, a longtime collaborator of Hong Kong’s visionary filmmaker Wong Kar-Wai. Running through Jan. 10, the show features more than 100 of Shya’s most iconic works in film and print over his 25-year-long career, as well as photographs from his personal collection. Farther north up the river is the Power Station of Art, the first state-run museum dedicated to contemporary art in mainland China. Formerly the Nanshi Power Plant, the structure can be identified by its iconic 541-foot chimney. Original Design Studio spent six years retrofitting the industrial building and, since it launched in 2012, many big-name artists and architects have chosen the PSA to host their solo exhibitions, including the recent “Works and Humanitarian Activities” show by Shigeru Ban and the “Renzo Piano Building Workshop” in 2015. 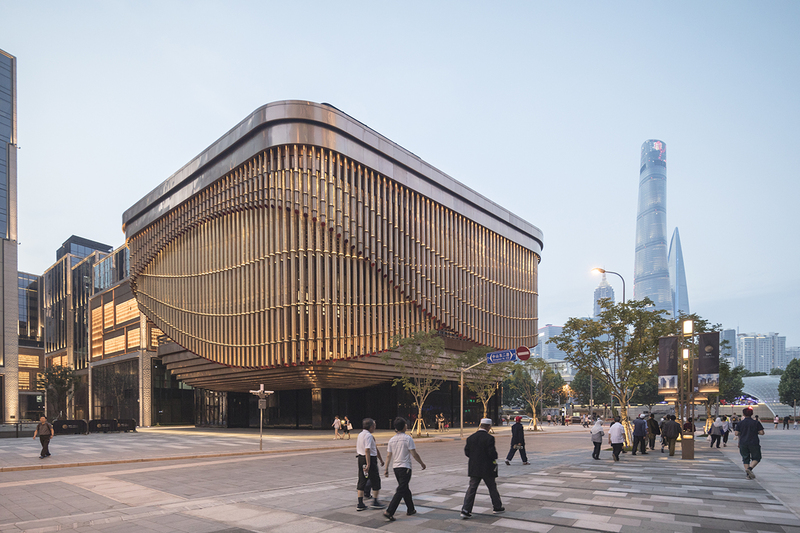 Considered one of the most impressive new buildings along the Bund, the Bund Finance Center is the first major collaboration between Foster + Partners and Heatherwick Studio and home to the new Fosun Foundation. Hundreds of rotating bronze tubes, inspired by the curtains of a traditional Chinese theater, form the building’s facade and synchronize to music five times a day. Its rooftop houses Japanese artist Tatsuo Miyajima’s permanent spatial installation, “Counter Sky Garden,” which is made up of of 300 LEDs with the numbers one to nine blinking simultaneously at different speeds. Inside, a series of venues host art exhibitions, small performances, fashion shows, and conferences, including the inaugural edition of the Business of Fashion China Summit that took place in October. Through Jan. 7, visitors can catch the late German artist A.R. Penck’s first posthumous show since his death in May, 2017. “Made in China” holds negative connotations for many, but the country’s new generation of creatives are working hard to change that. Uma Wang, Angel Chen, Sankuanz, Xander Zhou, and Museum of Friendship are just a few examples of young fashion designers and labels that have emerged both at home and abroad, drawing clued-in locals away from the big-name fashion houses. A major force supporting the rise in local talent is Dongliang, a multibrand concept store, which first opened in Beijing in 2009. Set in a two vintage villas in the former French Concession, the Shanghai outpost is designed by founder Nam Ron. One high-end global brand looking forward is Hermès, which collaborated with designer Jiang Qionger to establish Shang Xia, a modern lifestyle label marrying contemporary design with Chinese arts and culture. 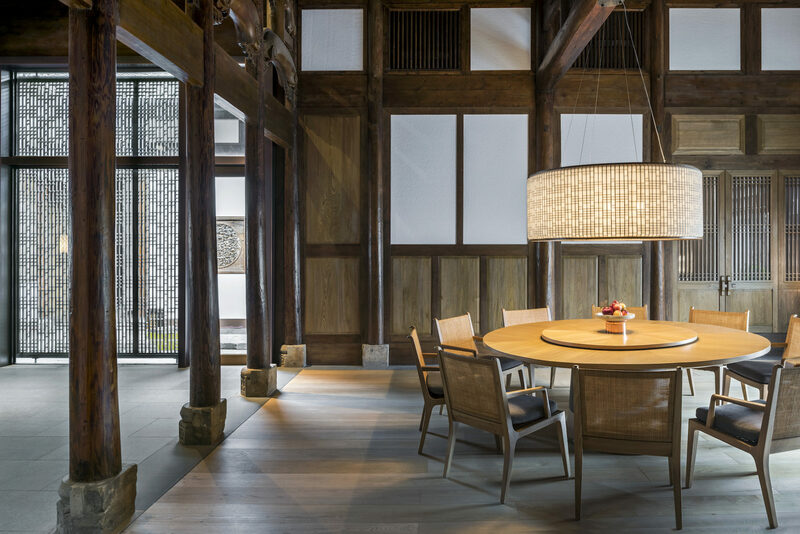 Head to its Kengo Kuma–designed villa on Middle Huaihai Road for signature pieces produced by rural craftsmen, including tea wares, woven-bamboo bracelets, and accessories collections, as well as rotating cultural exhibitions. Neri & Hu’s Design Republic Design Commune, in a retrofitted police headquarters built by the British around 1910, showcases its sophisticated taste level with a well-edited selection: Alessi kitchenware, lighting fixtures by Dutch brand Moooi, and Neri & Hu’s own line of modern Chinese furniture. To honor the colonial history of the complex, Neri & Hu retained the building’s brick facade, while inserting glass and steel in the storefront, which offers a view into the minimalistic showrooms. If the popularity of The Rap of China, a reality singing and rapping competition streamed by millions of Chinese viewers this summer, is any indication, hip-hop has entered the mainstream—as has its style. The best local streetwear is found at DOE’s new Xintiandi shop, by architect Shuhei Aoyama, an industrial space with a massive, central wooden “box” displaying coveted releases from Nike, Adidas, and Converse, sporty hoodies and tees, and seasonal collaborations with cult labels.